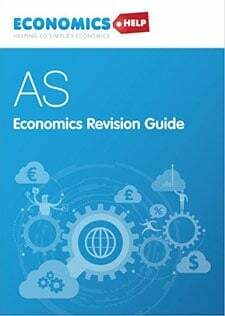 Includes short-run aggregate supply (SRAS) and long-run aggregate supply (LRAS) and classical and Keynesian view of LRAS curves. 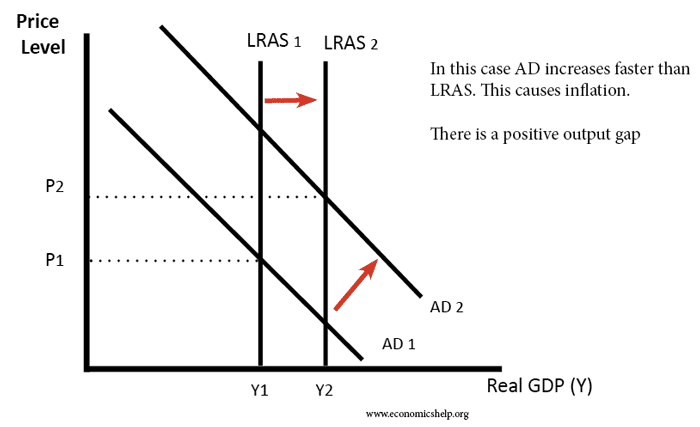 A simple macroeconomic equilibrium where AD = AS. This shows an increase in AD when the economy is close to full capacity, causing a significant rise in price level. Increase in AD, when the economy is close to full capacity leads to increase in Price Level and only small increase in real GDP. 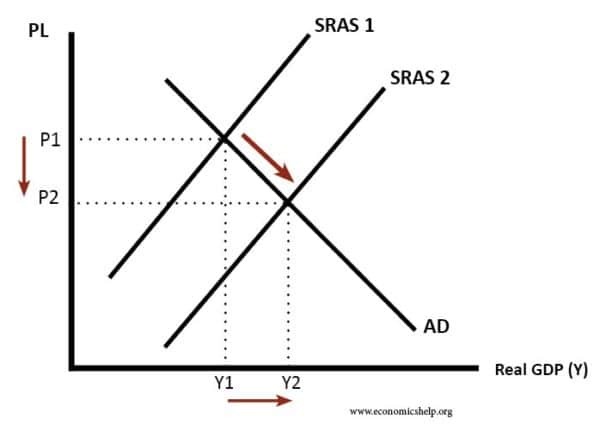 In this diagram, the increase in AD causes a bigger percentage increase in real GDP and a smaller increase in price level. In this diagram the AS curve shifts to the right, increasing real output and decreasing the price level. This could occur due to increased productivity, better technology or improved supply-side policies in the economy. 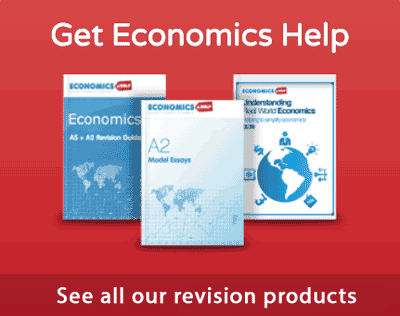 AD increases faster than LRAS – causing inflation. 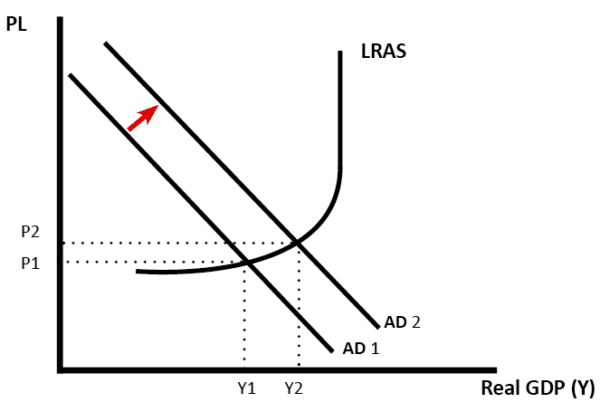 Keynesian economists believe LRAS is not perfectly inelastic. This diagram shows an increase in both LRAS and AD, causing economic growth without increase in price level. At close to full capacity, an increase in AD causes inflation. The impact of an increase in AD depends on the situation of the economy. 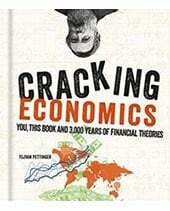 This could occur due to an increase in the price of oil or other raw material. 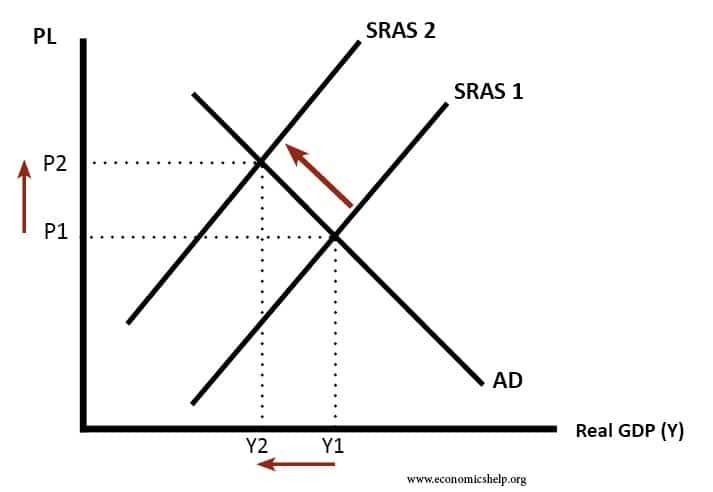 SRAS shifts to the left, leading to higher price level and fall in real GDP. A fall in the price of oil will shift the SRAS to the right. 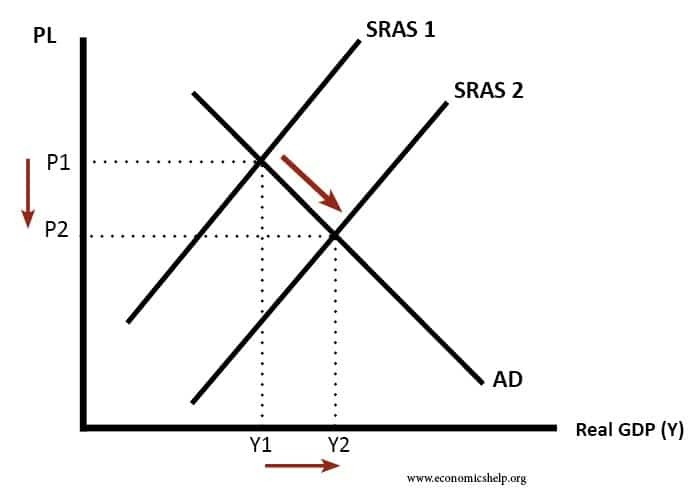 I would use SRAS for showing the effect of a change in costs (e.g. oil prices, wages). 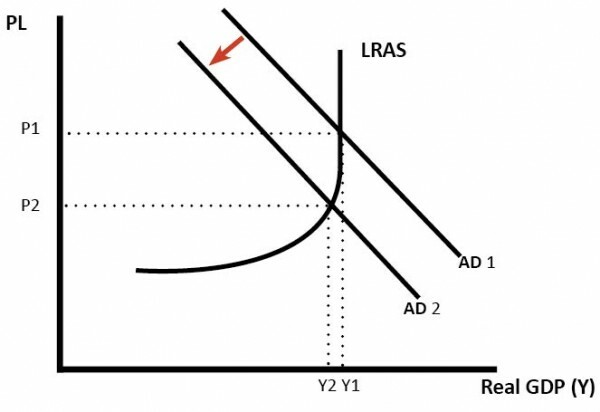 I would use LRAS for showing the impact of an increase in capital, an increase in productive capacity (long-term economic growth). 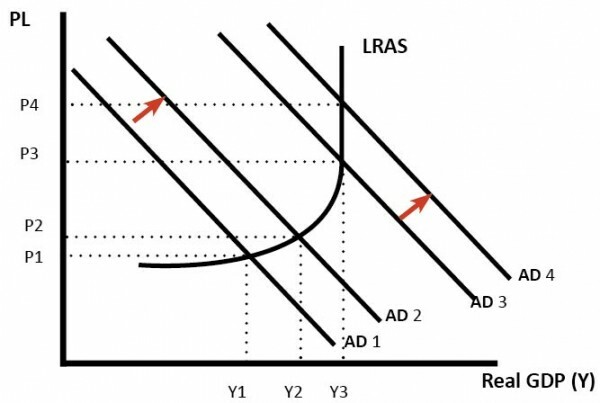 When to use Keynesian LRAS and Classical LRAS. 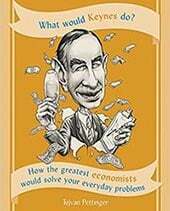 It doesn’t matter in the sense that both are acceptable economics. 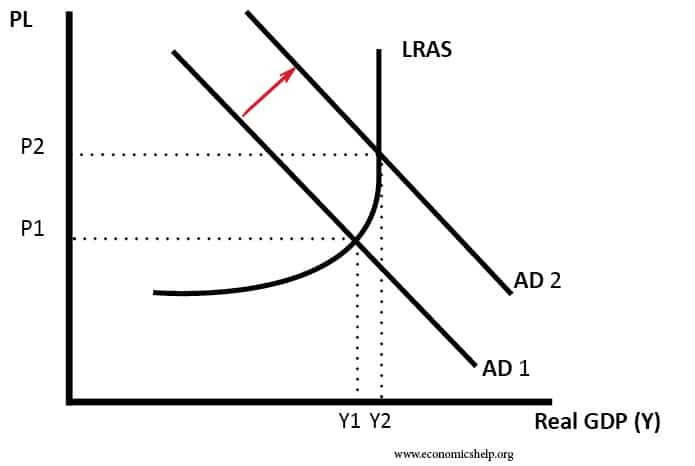 I prefer the Keynesian view of LRAS (sloping upwards) because I feel it is closer to reality. Also, it is good for using for evaluation. 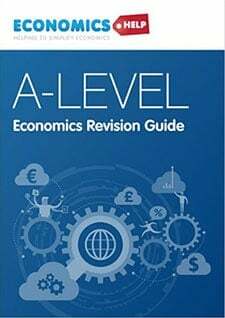 However, some exam boards state a preference for the classical view of LRAS – inelastic. 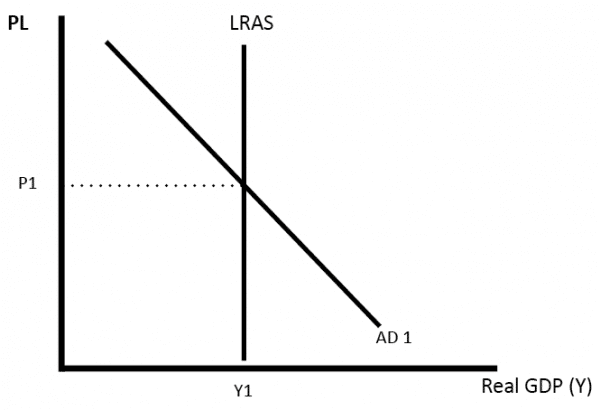 isn’t the LRAS a vertical line as the output number doesn’t change with the price. 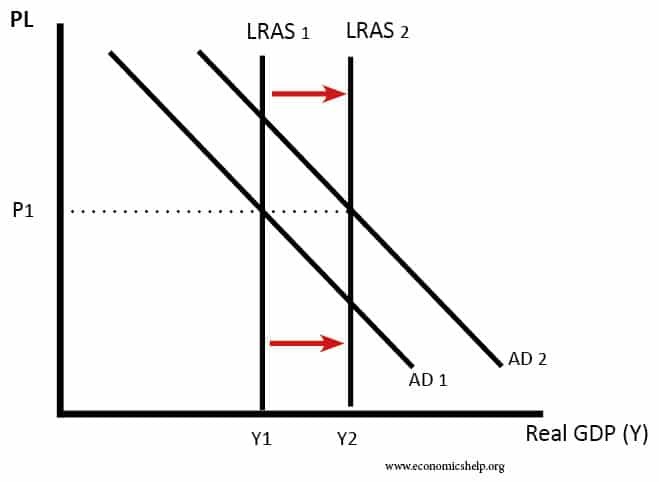 The classical view of the LRAS is certainly inelastic. 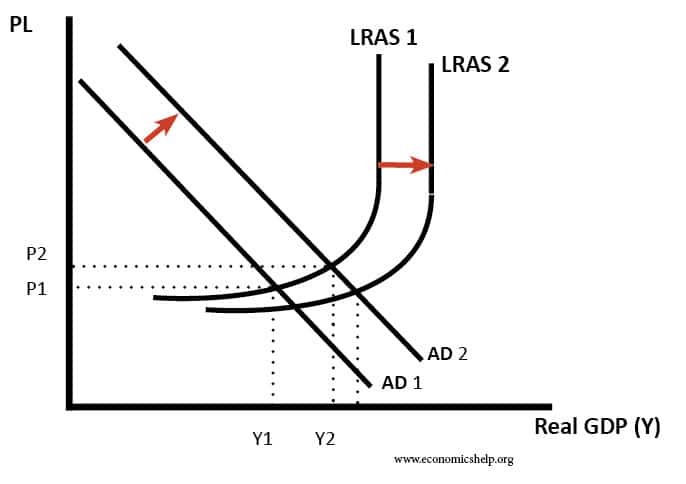 This shows a Keynesian view of LRAS which is inelastic at full capacity but also has areas of spare capacity.